Zebra Pen | More Crunchy Beach Mama! I don’t know if it’s weird to really like pens, but our family does. Hubby seems to like the expensive ones and the kids and I love the different colors, especially in gel! We doodle, plan, and write our little hearts out. Steel Pen ~ Featuring designer stainless steel from tip to clip, the barrel is entirely made from stainless steel allowing it to withstand extreme conditions. Hubby snatched this right up! It is definitely a tough ‘man’ pen and he is thrilled to be writing with something cooool. Sarasa Metallic Pens ~ Available in gold, silver and copper, these colored pens glide easily on light and dark paper and are perfect for decorating holiday crafts, cards and present tags. Perfect for writing on dark pages in your scrapbook and for signing and addressing holiday cards. Makes it all more fun! 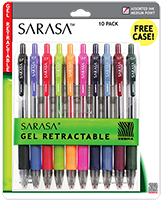 Sarasa Gels ~ Zebra’s #1 selling retractable gel pen boasts a soft rubber grip providing superb writing comfort and control. Loooove these pens! Gel AND Color! I use them daily for writing in my calendar, leaving notes for the family, and posting sticky notes for myself on the fridge. So fun! Cadoozles Mechanical Pencils ~ kids love the vibrant themes, but parents will love how practical they are! These are a MUST for any kid! Our mouth dropped when we first saw these. We are so excited! They look like normal pencils in bright colors WITH erasers but they are mechanical! We go through pencils like crazy and I just bought a ‘good’ pencil sharpener that is already busted. Grrrrr. I will be buying these forever! What do you like to do Doodle & Write with? I received these pens for review but was not compensated. All opinions are my own. This giveaway will end on Jan. 17, 2011 at midnight EST. Winners will be drawn via rafflecopter. Once a winner is drawn I will contact them and they will have 48 hours to reply before I draw a new winner. Giveaway is open to anyone in the US and you must be 18 years of age or older. Winner will be posted in the rafflecopter widget. I LOVE these pens esp the Sarasa gel ones! 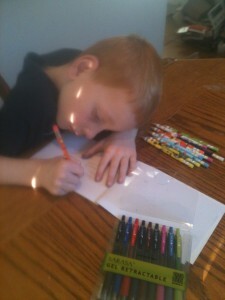 My grandson collects pens and pencils. What a great suprise it would be if he won. Thank you so much for all these giveaways! You are awesome! I love trying new pens! What a fun and useful giveaway! Thanks for the chance! I love the gel ones the most! I did not know anyone made retractable ones!